The summer of love (at least in the San Francisco Bay Area) was in 1967. 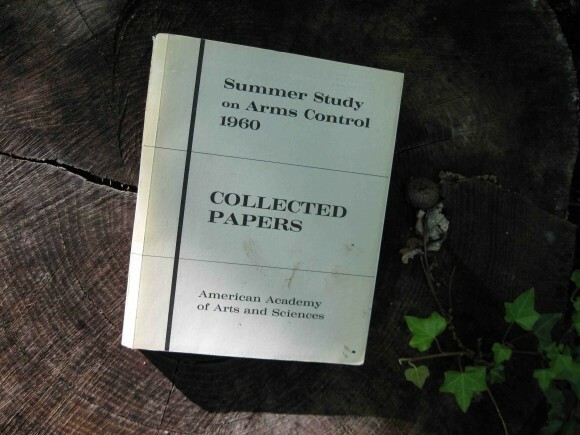 The summer of arms control was in 1960. Longstanding readers of these posts may recall my ten favorite books on arms control. Two of them – Schelling and Halperin’s Strategy and Arms Control and Arms Control, Disarmament, and National Security, edited by Donald G. Brennan — gestated in a 1960 summer study in Cambridge, Massachusetts, when serious brainpower – including Brennan, Schelling, Halperin, Jerome Wiesner, Bernard Feld, Henry Rowen, Victor Weisskopf, Louis Sohn and Hans Bethe — conceptualized the practice of nuclear arms control. There was a companion volume to Brennan’s book, Summer Study on Arms Control: Collected Papers, which has hardly seen the light of day. It’s a low-budget production published by the American Academy of Arts and Sciences that includes informal musings, seminar notes, graphics, rough computations and short papers – the raw material for what became known as nuclear arms control. how can another country try to control a different countries defenses? ?i believe we should focus on creating defenses against enemies weapons instead of always trying to control them.we are miles away from different countries and trying to control what we cannot oversee is an never ending problem. Creating defensive capabilities as a means of countering opposing offensive capabilities is ultimately counter-productive.It serves to encourage ever increasing offensive preparedness to infinity.It has been shown that accepted norms can be established and mutually adheared to for decades.This form of nuclear strategy has the added benifit of containing costs. Michael, thanks so much for highlighting this important but as you say little known volume. I remember coming across it in the King’s College library during my PhD studies on Schelling and Lawrence Freedman (my supervisor) suggesting that I write something on it. I never did! He was right and I was silly not to take up the chance. It’s a great insight into how exploratory and energetic those very few years were: quite remarkable, a certain rawness too, and therefore gives a much better sense of that creativity than the finished volume. Thanks! The next best thing from being there.